Pushkar is known to be a holy-city, and hence there ain’t any non-veg food happening in the city. Nor is alcohol welcome anywhere. That said, there is this other medium of inebriation, for which, the city is very well known. It is called ‘bhang’, or cannabis. You can read my experience with ‘bhang’ here. For the rest of the food-scenario, please read on. The food scenario in Pushkar is just like the city itself: ‘multi-faceted’. There are two distinct kind of cuisines prevalent to the culture here. One, which is innately Rajasthani in its preparation, another, which is the bastardized version of cuisines from far off lands. It is much loved, and is a potpourri of touristy influence on the city. I am going to talk about both, seamlessly. When it comes to being ‘pocket-friendly’, Pushkar is a backpacker’s heaven. 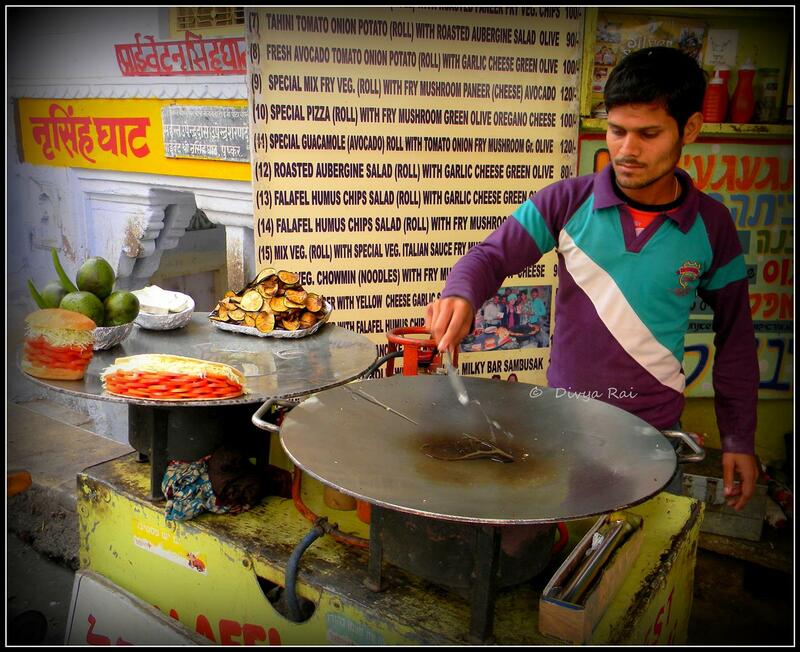 1) Dal-chaat/Dal-pakwaan: A must-have street-food from Rajasthan. This comprises of a multitude of elements from the Indian street food, spread on a cracker or papadam. It truly is a work of art. For the man who made this for us, it seemed to be a meditative journey of sorts. Dal-chaat is: moistened flattened rice, bhujia, onion,-tomato-dhaniya, spices, chutneys etc spread on the cracker and when it is had, there is a burst of flavors AND texture in the mouth. Like all ‘poha’-joints in Rajasthan, this is a morning (breakfast) affair and the fully-functional hand-cart can be spotted as early as 8 am. Ask locals for direction. Kadhi is an essential part of the Rajasthani and Gujrati cuisine. More so in Rajasthan, because the state lacks water-resources and hence, the cuisine cleverly weaves in other options like milk, curd, chaach (buttermilk) etc to make up for it. Kadhi uses either whipped curd or chaach (buttermilk) depending on the requirement and availability. The one with the buttermilk gives smoother texture than the one with the curd. Mirchi-vada is essentially what is known as Mirch-key-pakodey in North India (basically chilly-cutlet). The pepper used for this purpose is mildly hot and the process of frying kills/reduces its intensity further. Therefore, this street food is mirchi-vada served with a generous helping of kadhi. I am personally not a fan of kadhi, and that could be the reason that I did not like this preparation much, but you can give it a shot if you want. 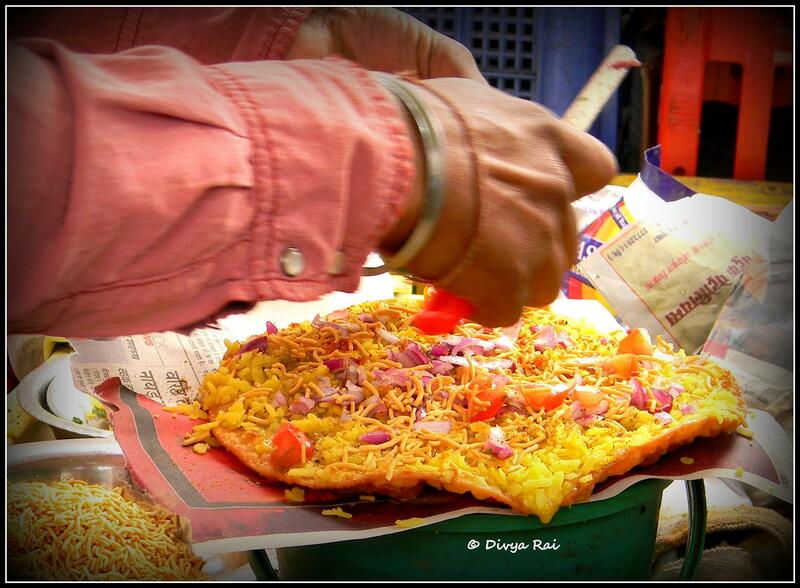 3) Poha: Poha is one of the most favorite beak-fast street-foods of Rajasthan. It is healthy, easy and quick to make (even at home). In some parts of Rajasthan, Poha-hand-carts start their day at around 7:00 am and are completely sold-out in two hours flat! The moistened flattened rice, once the preparation is ready, tastes mildly sweet, sour with a bit of crunch in the bite. It is comfortably spicy, easy on the palate and light on the tummy. 4) Falafal/laffa: This is a middle-eastern delicacy. It is a flat-bread, rolled in with various kinds of fillings. The picture below is a sample of filling options falafal has. I had falafal from Ganga restaurant, which is close to Narsingh ghat. It seemed to be a neat little food-shack with fairly clean set-up. Why is there no picture of this particular food item? Simply, because I could not wait to click picture. Love the explanation and deconstruction of the food items and details of there location.